This plugin helps send a personalized message to your customers Facebook Messenger inbox. Make the conversation with your customers. Bring them back to check out page. Close the sale. Facebook Messenger has been growing potentially over these years. Over 2 billion people use Messenger every day. Sending a message via Facebook Messenger benefits greatly, reaching to an 90% open rate. This is the best way to send message remarketing campaigns and it makes your customers feel special and closer compared to sending Email. 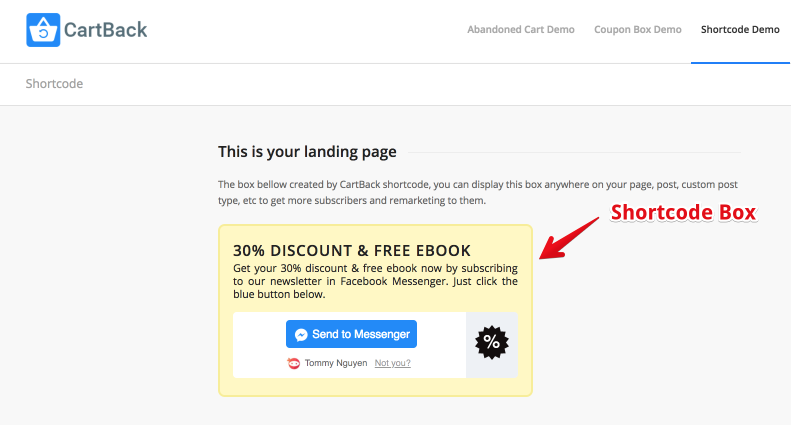 - “Send to Messenger” Coupon Box: A “Send to Messenger” Coupon Box can be created and put on your single product pages to offer discounts for your customers. Discounts bring you sales and CartBack helps you keep those customers in a database. 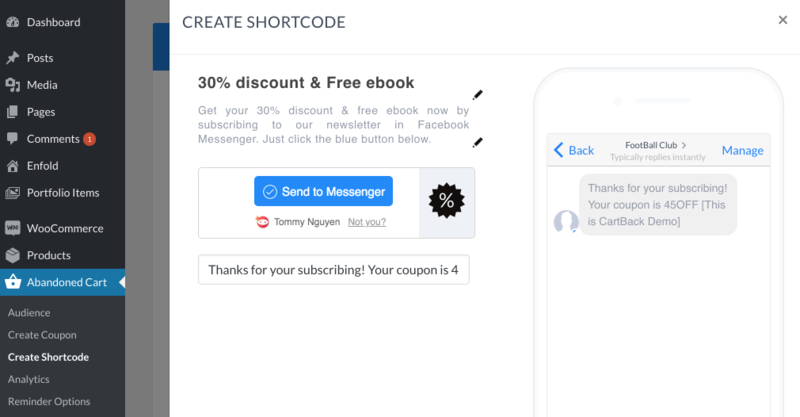 - “Send to Messenger” Shortcode Box: “Send to Messenger” Shortcode Box can be put on a landing page to offer your customers future deals, for example. Once they opted in, deals can be sent to maintain your relationship between you and your customers. Real results mean real numbers. See how this plugin is growing your business using our dashboard. In Analytics section, you will see number of add to cart users, number of messages sent in each reminder, first reminder, second reminder or third reminder. Besides, clicks, purchases and revenue are also presented. 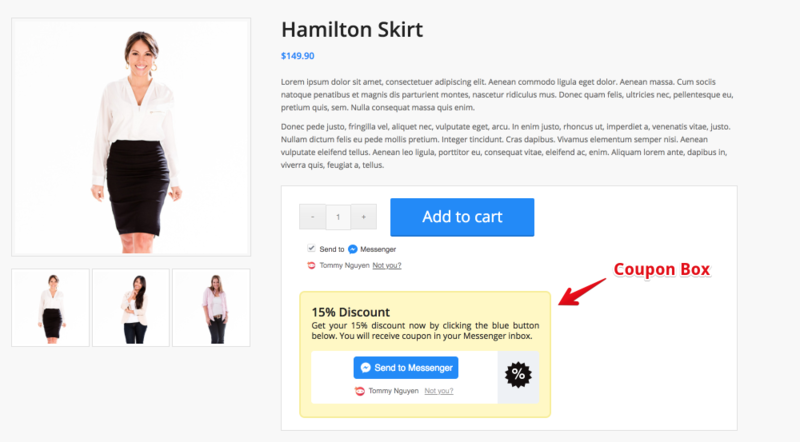 After you install the plugin, a “Send to Messenger” checkbox will appear on your single product pages below the Add to Cart button created by WooCommerce. The checkbox will be presented with your customer’s name in case he is already logged into Facebook via the browser. Once he ticks the Messenger checkbox and clicks Add to cart, he then automatically gets opted in to get Facebook messages from your Facebook page. Your page then sends him 3 alert messages if he didn’t check out. You can set time and customize content for these 3 reminders. More than that, you are also able to send out custom remarketing messages later on. Q: Is the “Send to Messenger” box checked by default? A: No, it’s not. The checkbox cannot be autochecked anymore since Facebook changed API. Q: Can one product page have many add to cart buttons with many checkboxes respectively? A: No, the plugin supports each product page with one add to cart button only. Q: If my page is unchecked, how can I ask users to check the box before adding to cart? A: You can customize “Skip it” text – a line to ask people check the box by offering a discount. For example, “Please check the box below and I will send you a coupon of 10%OFF via your Facebook Messenger” or “Skip it”. Therefore, users can check the box or Skip it if they wish. Q: Who is the sender of the reminder Facebook message? A: Your Facebook page automatically sends the message. During install, you choose to connect your Facebook page. And that Facebook page has to be under your page role as an admin, not other roles. Q: How many reminder messages get sent? A: We send three Facebook messages on your behalf. One will be sent after the cart gets abandoned, the second one will be after the first one, the third one is after the second one. You can set time for these three reminders, they are in a range of 1 hour and 24 hours. In those cases, we check to make sure the customer did not close a sale before we send them a message! Q: Can I customize the reminder message? A: Yes, you can customize the body of the message as well as the call-to-action button. Q: Is this within Facebook’s terms-of-service? A: Yes, when your visitor opts-in through the checkbox, you are allowed to send him reminder messages. Q: Is visitors’ information collected in the list right after they click Add to cart? A: Yes, it is. After a user clicks add to cart, you got him/her on the list without full information. In case he/she messages you back, you got full information including his/her Facebook Avatar, First Name, Last Name, Gender, Locale and you can click on the Avatar to go to his/her Facebook profile. In both cases, whether the customer messages you back or not, you are able to send out any custom message, especially send out remarketing messages afterward. Q: Is there any difference between users who added to cart, users who checked the shortcode box and users who checked the coupon box? A: With users who added to cart, you can only see full infomations (full name, Facebook profile, gender, locale) who send you a message back to your fan page ( after they receive reminder message). For users who checked the shortcode box and users who checked the coupon box, their info is all displayed once they clicked “Send to message” button and accept the permission to collect their public profiles. Q: I’m not seeing the messages being sent within the Sent folder of my Facebook business page’s Inbox. A: You’ll only see the message threads when your visitor replies. Most people just see your automated message and take action without replying. So you won’t see them in your Sent folder. But don’t worry, messages are being sent for your abandons! Q: Do you count two messages to the same customer as 2 messages or 1? Q: Besides sending 3 reminder messages, can I send custom messages to all add-to-cart users afterward? A: Definitely yes! You can custom and send any messages because the plugin captures all your add-to-cart users in a subscriber list. Q: Do I need submit the app for Facebook review? A: Yes, you have to create an app at https://developers.facebook.com/ to connect the plugin with Facebook and submit for some permissions, please see how here https://ninjateam.org/how-to-submit-for-facebook-app-review-cartback-plugin/. We also have another solution for those who don’t want to create own apps by using our available app but it has some limitations, learn more. Q: How long is the Facebook review process? Q: What is the difference between Business Verification and Individual Verification? A: You can chat with our support at https://fb.com/ninjateam.org or submit a ticket at https://ninja.ticksy.com/, we’re always happy to hear from you. You consent to purchase our plugin which is built under Facebook Developers API, and you agree to the fact that Facebook can change any settings in their API functions at anytime they like. If these changes do affect some parts of the functions of our plugin, we’d do our best to make sure the plugin still serve you, but in case some functions becomes deprecated due to these Facebook changes, then you accept it like so. Thank you so much.